Send pH Electrode Signal 0.3km (1,000') Over Ordinary, Wire and Connectors or Coaxial Cable. Interface pH Electrodes Directly with Inexpensive mV Meters and Recorders or Sophisticated Process Controllers and Data Acquisition Systems. Extend Useful Life of pH Electrodes. Available With/Without Automatic Temperature Compensation. PHTX-20 series have been discontinued. For the possible replacement, please check out PHTX-100 series or TXUN Series for details. OMEGA’s PHTX-20 series Preamps are unity gain preamplifiers which convert the high impedance mV signal of a pH or ORP electrode to a low impedance signal. This signal can travel up to 1,000 feet using ordinary wire and connectors to high impedance input pH meters and controllers (such as OMEGA’s PHCN-37 vol. 29 pH and Conductivity Handbook, page 84), and to standard Process Meters and Controllers such as the DPi/CNi which could not otherwise interface with the high impedance signal. In many applications the PHTX-20 series Preamps will be able to extend the useful life of expensive pH electrodes. By lowering the output impedance of ageing electrodes, the PHTX20 allows them to continue to function and provide a measurable signal. The PHTX-21 is powered by lithium batteries with an estimated life of 5 years when used with high input impedance instruments. The electronics are entirely encapsulated in an epoxy filled stainless steel enclosure. The input and output connections are industry standard BNC. 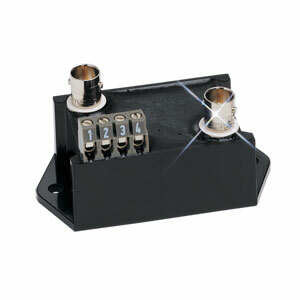 The output can be split from coaxial to separated leads with the 3073 adapter. The PHTX-22 is a 10-40 volt dc powered preamp. Power can be provided by the excitation of a process meter (such as the DPi8) or the optional power supply. The electrodes are entirely encapsulated in a compact epoxy filled enclosure designed for easy mounting in a manufacturing process. The PHTX-22 offers redundant outputs from either a BNC connection, terminal strip or both at the same time. 참고: Each unit supplied with operator’s manual.